University Circle is a center of innovation in medicine, education and culture—a district rich with historical landmarks, parks, restaurants and lively, activated spaces that draw travelers and residents alike. The diverse experiences that University Circle offers make the district a heavily traveled area. This world-class tourist destination is one square mile of urban streetscape and meandering byways that intersect the district. Museums, cultural institutions, a university and healthcare campus are intertwined in a vibrant environment that attracts visitors from across the country and world. University Circle needed a signage and wayfinding program that aligned with its brand strategy and served multiple purposes. Debbie Berry, University Circle Inc.
By mapping out travel paths to individual destinations in the district, Guide Studio determined where traffic converges and identified key decision points where signage would be most helpful. From this study, a wayfinding hierarchy was developed to give visitors the information they needed at the appropriate place and time, without cluttering the district with excess signage. Signage content criteria were developed to establish standards for current and future signage. This serves as an important reference for institutions in University Circle and helped explain the rationale behind the selected sign content. 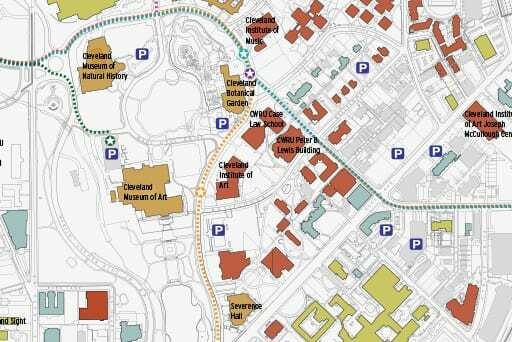 Vehicular and pedestrian signage support the initial wayfinding program and further the ease of navigation within University Circle. People who visit the district today have remarked on the effectiveness of the sign program and their ability to easily find their way around.